Uninterruptible Power Supply (UPS) device(s) physically connected to the Smoothwall provide emergency power if the mains power supply fails. 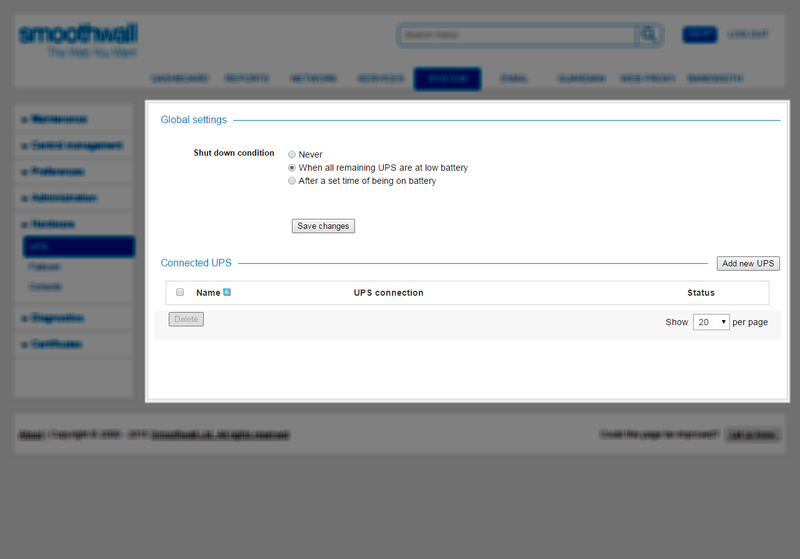 The Smoothwall also makes information about UPS devices available on the System > Central management > Overview page. For more information, see Monitoring Node Status. It is also possible to configure an alert which is triggered when power switches to and from mains supply. For more information, see Enabling Instantaneous Alerts. 1. Follow the documentation delivered with your UPS device to prepare it for use. 2. Connect the UPS device to the Smoothwall. 3. On the System > Maintenance > Shutdown page, reboot immediately. Once rebooted, you are ready to start configuring the UPS device. The global shut down condition determines when, if ever, a Smoothwall connected to a UPS device should shut down. 1. Go to System > Hardware > UPS. • Never — Select to never shut down the Smoothwall. • When all remaining UPS are at low battery — Select to shut down the Smoothwall when all currently connected UPS devices are at low battery levels. • After a set time of being on battery — Select to specify how long to wait before shutting down the Smoothwall when on running on UPS battery. If this option is selected, specify the delay, in minutes, in Delay before shut down. 2. From the Connected UPS panel, click Add new UPS. • Name — Configure a meaningful name for this connection. • UPS connection — Select USB. 4. Click Add. The Smoothwall adds the UPS device and lists it in the Connected UPS area. • UPS connection — Select Serial. • Manufacturer — From the drop-down lists, select the UPS device’s manufacturer and model. • Port — From the drop-down list, select the port the USP device uses. • UPS connection — Select SNMP. • IP address — Enter the IP address that the UPS device will use. • SNMP community — Enter the UPS device’s SNMP community string. • UPS connection — Select HTTP. • Username — If required, enter the user name to be used to connect the device to the Smoothwall. • Password — If required, enter the password to be used to connect the device to the Smoothwall. • Confirm — If required, reenter the password to be used to connect the device to the Smoothwall. 2. Highlight the device you want to edit and click Edit. 3. Edit the configuration as required. For a detailed description of each setting, see Managing UPS Devices . 1. Go to System > Hardware > UPS page. 2. Highlight the device you want to edit and click Delete. 3. When prompted, click Delete to confirm that you want to delete the device.